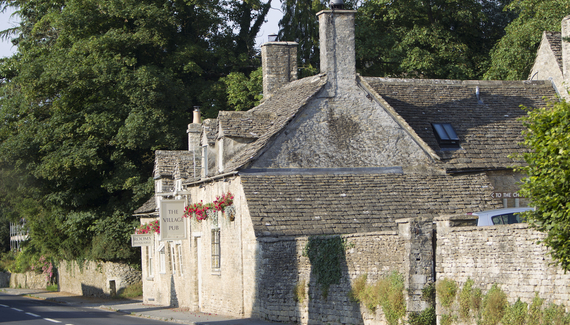 An old favourite of locals and faithfuls from far and wide, this civilised Cotswold pub has been given a gentle facelift by Calcot Health & Leisure – owners of Barnsley House across the road. Expect seasonal food based on the best local produce, good-quality Hook Norton ale and decent wines. There's even a service hatch to the heated patio at the back, so you can sip the sauvignon until the sun goes down. Cotswold stone and ancient flags sing the country theme; past bar and open fires, quiet alcoves provide a snug setting that entices you to stay. If you do, tuck into crab and leek tart, rib-eye steak with béarnaise sauce, or whole plaice with crab and parsley butter; sweet tooths might fancy warm ginger cake with rum and raisin ice cream. 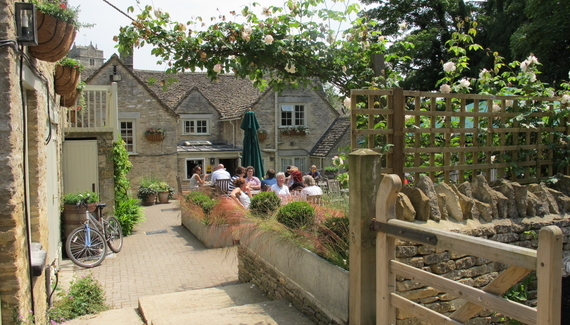 Have you visited The Village Pub? Starters from £6. Mains from £11.